Why Hire Woody As Your Magician? First magician to win both of the largest close-up magic contests in Scotland in the same year – making him, ‘The Scottish Table Magic Champion’. 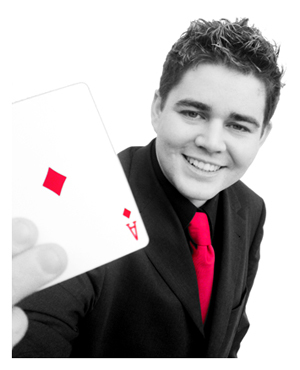 First Scottish magician to win the Scottish Conjurers’ Association’s Close-up Magic contest 3 years in a row (2007 – 2009). High repeat repeat booking rate from happy clients. To assist with business networking, build crowds at trade shows, entertain at product launches and office openings. Show your friends and family you love them with a completely unique party experience. Woody can learn about your guests and make them part of the show – the ideal surprise guest! Close up magic – Also known as street magic and table magic. Close-up magic entertains people in small audiences with card tricks coin tricks etc – popular during drinks receptions and in between the courses at the meal. 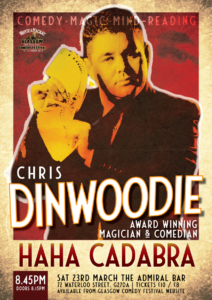 Stand-up / Cabaret magic entertains everyone at the same time – popular for house, dinner and birthday parties. The show combines classic magic tricks , modern mind reading (mentalism), lots of audience participation and comedy.